It is my greatest desire to live each and every day with unlimited confidence. Sometimes a sequin shirt on a Saturday for a doughnut run is completely appropriate. 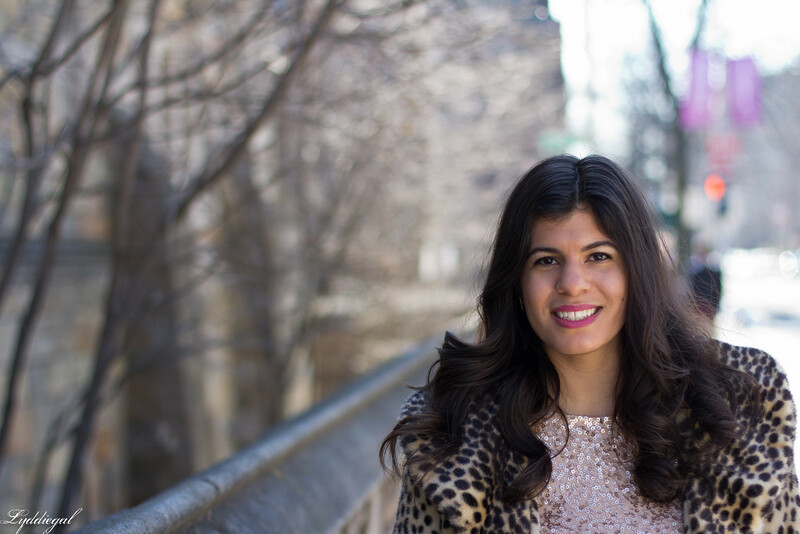 Most of the time, I'm the person who fades into the background, not socializing at a party or speaking up for myself, yet when it comes to getting dressed, I have no qualms about going out in a sparkly top in the middle of the day or putting on an even more ostentatious coat with matching shoes. If only that confidence could transfer to the rest of me. Love the look so pretty! Yesss, girl! Sometimes sequins and animal print are needed for a weekend coffee run for that extra confidence boost. You look amazing! That coat is everything. It's funny, but I think I gravitate increasingly towards simple, neutral clothes - which I always have - because I am absolutely not a person who fades into the background. I'm so often on the receiving end of statements like, "Why don't you tell us what you really think?" because I'm so, well, willing to bluntly say exactly what I think no matter who might hearing. I'd gladly pass a little bit of that on to you if I could - but sequins are a good place to start. Your top is so lovely, the blush colour is gorgeous. Girl, with this fab sequin top and all this beautiful animal print, you gotta let your clothing confidence transfer to your personality. Don't be shy away from life. Use the clothes to help build up your confidence. This is certainly something I've done for myself in the past. Sequins are always a good idea! Especially with animal print! Beautiful look! 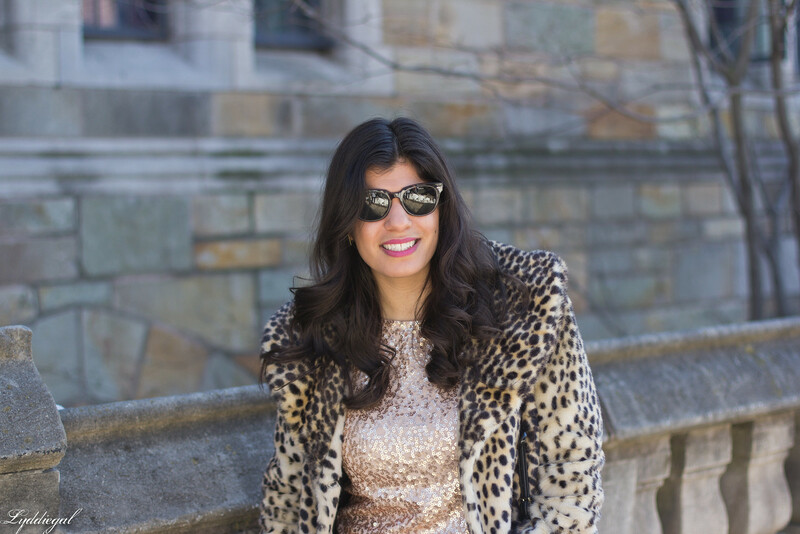 I love the leopard paired with sequins! We all need to wear sequins more often during the day time! They make the whole day feel more glamorous and special! My mom (the 70's model on my blog) always scoffs at me when I want to style her sequin shirt!! She's still of the thought that it's only for dress up---but I love the idea of wearing them whenever!! What a fun look! 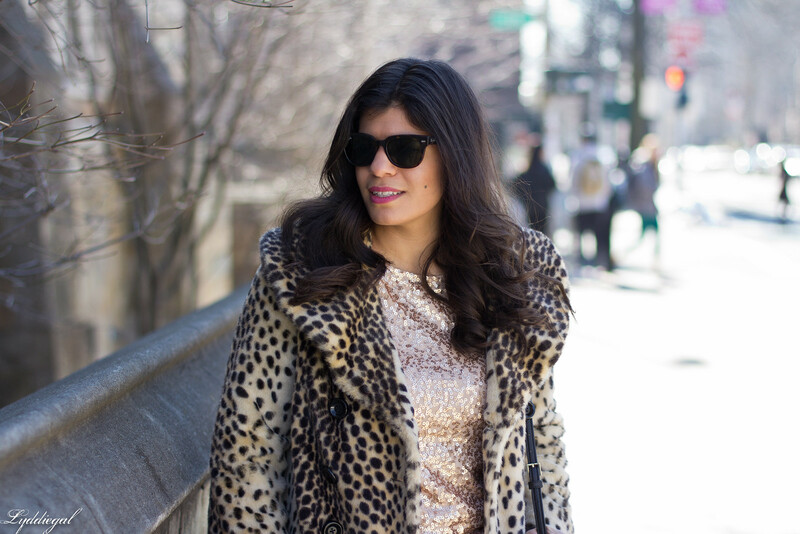 I love the sequins and leopard print everything! 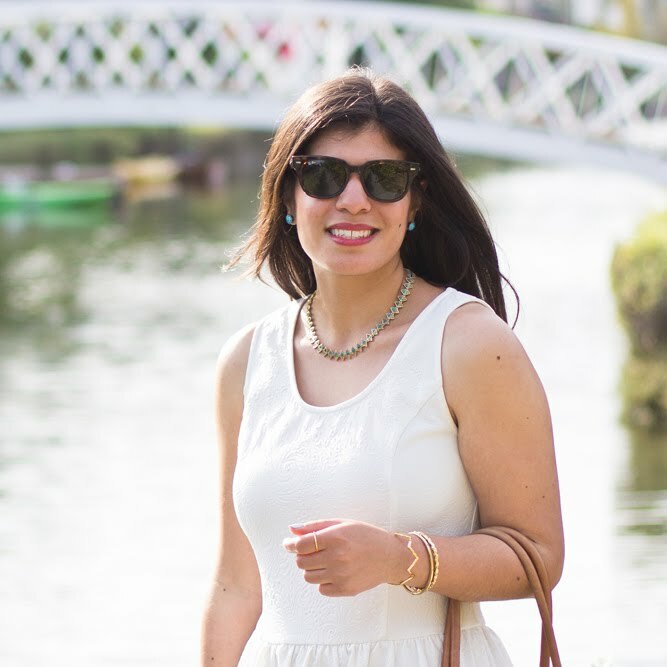 I totally agree that sometimes dressing up during the day is fun and it gives me a boost of confidence! SO gorgeous!! Love the sequins + leopard look. Also, sequins are totally appropriate for donuts because why not??? Omg in love with this look! Leopard and sequins?! Yes please! I love your sequins and leopard together! So pretty on you! 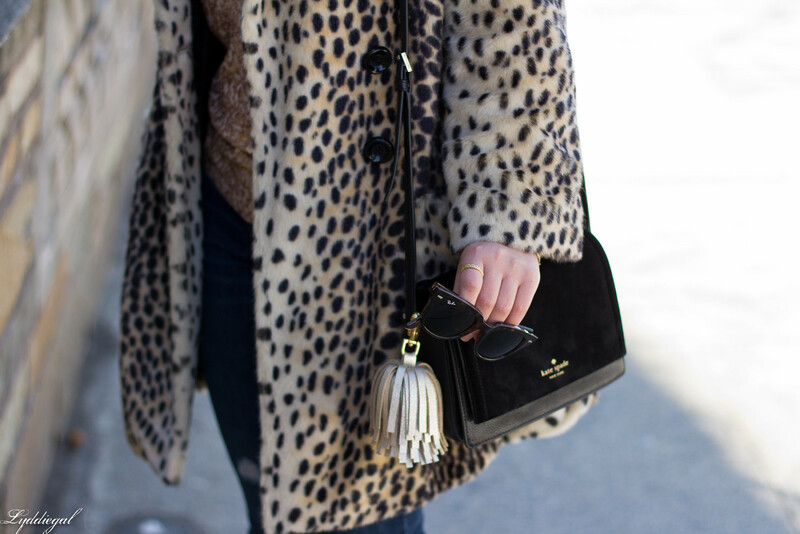 I love the leopard and sequins styled together! This is such a fun look! 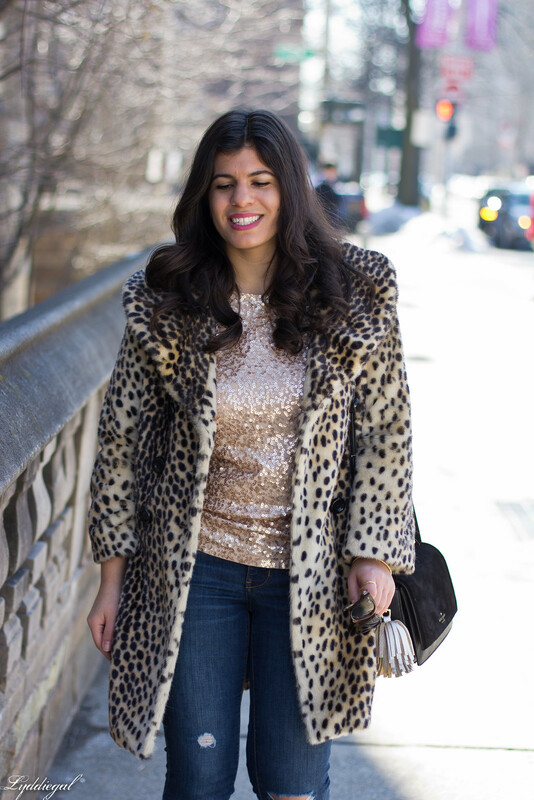 Sequins pairs well with leopard. I never tried it before. That bag is gorgeous. Love the coat and super cute sequins top. I tend to stick to neutrals and I have a similar coat which I should probably wear more. I love the idea of wearing sequins for a daytime doughnut run being a metaphor for exuding confidence. We should all learn the power of this kind of dressing (and living). Thanks for sharing such a personal post! 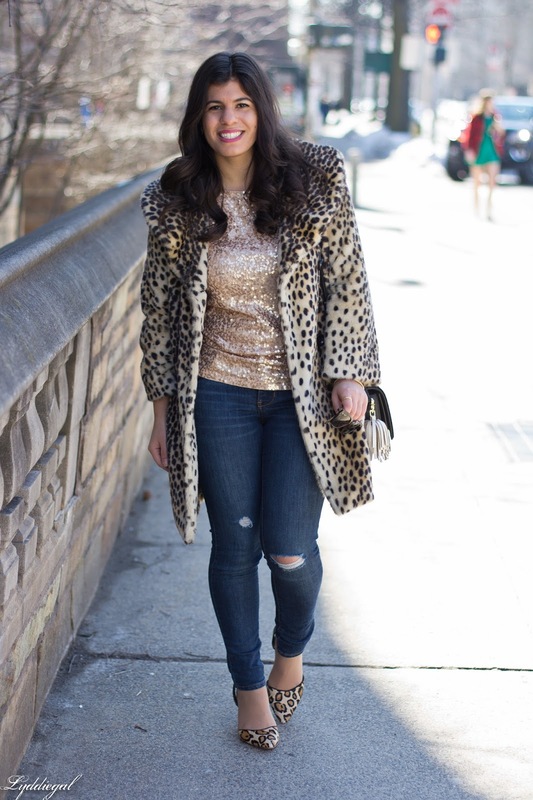 leopard and sequins are a wonderful combo and I absolutely love that jacket on you! I am totally with you! I saw rock those sequins anytime you want. I love getting dressed up. That coat is amazing too. It's funny because I always think of sequins for night, but I really like how you made them daytime appropriate here. This outfit is so cute! Very cool print outfit honey! Amazing coat!